This antibody recognizes the Myc tag epitope (EQKLISEEDL). A synthetic peptide, corresponding to aa 408-439 (AEEQKLISEEDLLRKRREQLKHKLEQLRNSCA) from C-terminus of human c-myc, coupled to KLH. 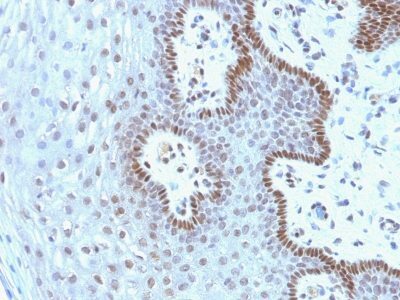 This antibody recognizes a transcription factor of 64-67 kDa, identified as c-myc. Its epitope spans the Myc tag epitope, aa 410-419 (EQKLISEEDL), which is a specific portion of an alpha helical region of human c-myc protein. Because the epitope is located at the dimerization site of the protein, the antibody is not sensitive for detecting endogenous c-myc, making it suitable for detecting Myc tagged proteins or myc overexpression. This MAb shows no cross-reaction with v-myc. Catalog number key for antibody number 0596, Anti-c-Myc (9E10.3) The prefix indicates conjugation, followed by the antibody number and size suffix.